Oh, I hope I never run out of Fred Astaire & Ginger Rogers movies. In this movie they play Bake and Sherry. Bake is in the Navy, Sherry is a dancer who once rejected Bake's marriage proposal. When Bake comes into town on shore leave, he runs into Sherry, and they both rethink their separation. Bake messes up Sherry's very important audition, though, and all bets are off. How do you say sorry? Give someone a monkey and screw with their next big audition, not necessarily in that order. There was also a bizarre side-story involving Bake's friend Bilge, played by Randolph Scott. After having one great date with Sherry's sister Connie, he felt that he was still free to play the field, and she felt that they had made an amazing connection and were getting married. Bilge's thoughts on Connie's thoughts? "She's a swell kid, but she's serious... She's sappy like you [Bake] - she wants to get married." And oddly none of Connie's friends told her that she was being a bit silly fixing up her father's giant boat just for Bilge and waiting for his proposal after just one date. There wasn't even any word from him while he was back at sea, and still she waited. She was told oh, he's just being silly... He'll figure it all out in time. She is told to fight for her man. But she practically imagined him! Nonetheless... do you think she got him in the end? 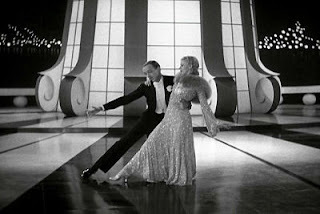 ...which is of course a very important part of a Ginger Rogers & Fred Astaire movie. Despite my love of the actors, I really want to give this movie one star. But I'm going to give it two stars due to the scene where they navy guys are all practicing for a benefit show on the ship deck, and some of the men have to be "dames." I really don't want to see it again, though. 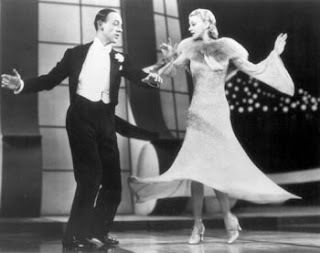 There were entertaining moments, but I think the whole buzz behind this movie is that it has what is considered to be one of Astaire and Rogers's best dance numbers (with the 25 pound dress). But that was not enough for me. I still love them in general, though!